Q. What about Sr. Lucy’s statements after 1960? She seems to be quoted every which way? Some quote her saying that John Paul II successfully consecrated Russia; others quote her as saying just the opposite. Some quote her as saying that the third secret was never intended to be revealed and that no one goes to hell, while others quote her as talking about the diabolical disorientation in the Church. A. After 1960 we are undoubtedly dealing with a massive conspiracy and an impostor Sr. Lucy. We will now cover the striking evidence that the enemies of the message of Fatima , starting during the reign of the Freemason, John XXIII, actually implanted an impostor Sr. Lucy who falsely acted as if she were the real Sr. Lucy. Nothing coming from Sr. Lucy after 1960 is reliable. 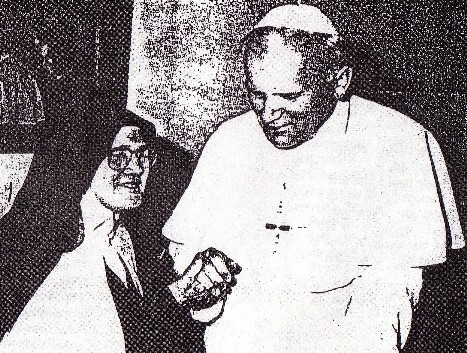 Note from the Diocese of Coimbra, July 2, 1959, on the Fuentes interview: “Father Augustín Fuentes, postulator of the cause of beatification for the seers of Fatima… visited Sister Lucy at the Carmel of Coimbra and spoke to her exclusively about things concerning the process in question. But after returning to Mexico …this priest allowed himself to make sensational declarations of an apocalyptic, eschatological and prophetic character, which he declares that he heard from Sister Lucy’s very lips. Given the gravity of such statements, the chancery of Coimbra believed it its duty to order a rigorous investigation on the authenticity of such news… but also with regard to things reported as having been said by Sister Lucy, the Diocese of Coimbra has decided to publish these words of Sister Lucy, given in answer to questions put by one who has the right to do so. 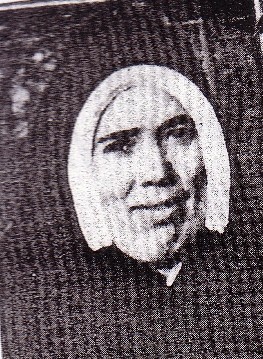 The real Sr. Lúcia in 1945, at age 38. Some believe she was forced into the pose on the right. In 1958, Masonry had had enough of her and killed her. Now here is the picture of “Sr. Lucy” in 1967 at age 60! You can judge for yourself, but the woman pictured here is not the same as the woman pictured above. First, this photograph is from 1967. Thus, this is supposedly “Sr. Lucy” 22 years later, at age 60! But this woman looks as young, or even younger, than Sr. Lucy when she was 38 years old! Second, the real Sr. Lucy (the first picture) has a different nose structure than this “Sr. Lucy.” This “Sr. Lucy's” nose is much broader; it's a different woman. Of course, while a person can (and often does) noticeably age when going from middle-aged to late middle-aged, he or she is still noticeably the same person – unlike in this case. But the post-1958 “Sr. Lucy” below does not have the characteristic dimples in her cheeks and the center of her chin. This “Sr. 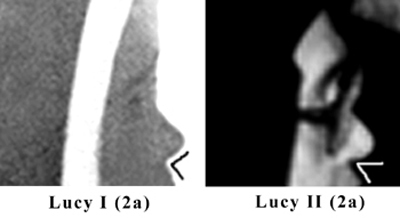 Lucy” has a predominant characteristic of a protruding, forward chin, which the real Sr. Lucy doesn't have (besides the different nose structure). This woman is not Sr. Lúcia of Fatima, but a phony Sr. Lucy that was implanted and specially picked to serve the purpose of the false Fatima line and the Vatican II religion that has been foisted on the world since the Fuentes interview. In addition to the photographic evidence, the fact that the post-Vatican II “Sr. Lucy” is not the real Lucy screams out all over the place. 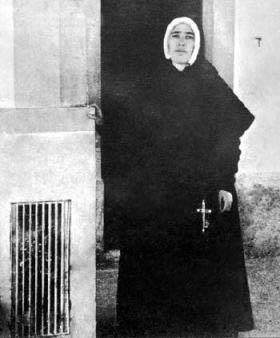 Sister Lúcia was never allowed to speak with her family except from behind a grille, but when they needed “Sr. 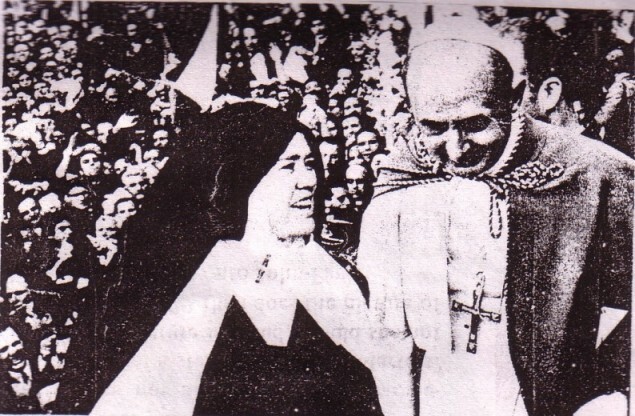 Lucy” to publicly endorse the Vatican II sect, its Antipopes, and their failure to release the third secret, she was neatly presented to the world at Fatima in 1967, so that she could be seen hobnobbing with her fellow conspirator, Anti-Pope Paul VI (below). Above photograph is an example of such a grille that some nuns live behind. The phony Sr. Lucy brought out from behind the grille to be seen by the world at Fatima in 1967 with her fellow conspirator, Anti-Pope Paul VI - to endorse the new religion, his ripping apart of Tradition, his promulgation of V-2, and his failure to release the third secret. Another question that springs to mind after viewing these photographs is: when did Sr. Lucy get her teeth fixed? 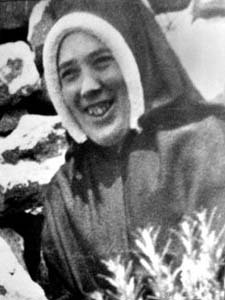 Here is a picture of the real Sr. Lucy; her front teeth were characteristically mangled. But in the photographs of the phony post-1960 Sr. Lucy, we see that her teeth are neat and straight, not large, projecting and irregular. Sure, it's possible that Sr. Lucy had massive dental surgery or had her teeth replaced to get them looking so neat and straight as the impostor Sr. Lucy's do, but it is more likely just another proof of the fact that the woman pictured above: right is not the real Sr. Lúcia. For those who find this hard to accept, I ask them to focus on two things: 1) Our Lord said that in the last days the deception will be so profound that even the elect would be deceived if that were possible (Matthew 24), and an impostor Lucy was crucial to the Devil’s plan of deceiving the world on Fatima. 2) Every traditionalist who doesn’t accept the Vatican ’s version of the third secret of Fatima (released in the year 2000) already believes that there was an impostor Sr. Lucy, but simply hasn’t figured it out yet, or isn’t honest or logical enough to admit it. It is undeniable that the Vatican ’s “Sr. Lucy” fully endorsed its version of the third secret, and its accompanying interpretation that it refers to John Paul II. This fact is not known from a letter that can be forged, but from undeniable video evidence of “Sr. 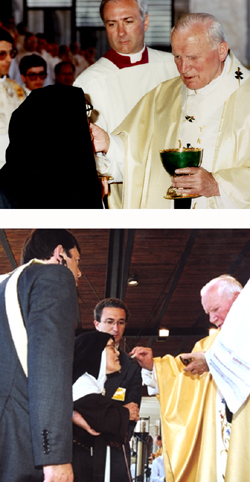 Lucy” at Fatima in 2000 for the “Beatifications” of Jacinta and Francisco. At this event, “Cardinal” Sodano (in view of “Sr. Lucy”) announced that the Vatican would be releasing the third secret of Fatima , and that it refers to the assassination attempt on Anti-Pope John Paul II. Everyone who was watching the event (as we were) could see “Sr. Lucy’s” reaction, so there could be no doubt about her being hidden away in order not to tell the truth on the matter (as the Grunerites might claim). “Sr. Lucy” made clear gestures signifying that she fully endorsed and agreed with “Cardinal” Sodano, that the third secret of Fatima refers to the assassination attempt against John Paul II! To anyone who is honest and logical, this is absolute proof that she cannot be the real Sr. Lucy, but is an impostor and an agent of the Vatican II sect. In the following quote, notice that even a Grunerite acknowledges the problem. He admits how “almost disquieting” it was to see “Sr. Lucy” endorse “Cardinal” Sodano’s interpretation of the third secret – yes, I would say so! – but he fails to draw the appropriate conclusion. There you have it: the phony “Sr. Lucy” fully endorsed the Vatican ’s version and interpretation of the third secret of Fatima. The only way that one could even consider her to be the real Sr. Lucy is if one fully accepts the Vatican ’s version of the third secret, and its interpretation that it refers to the assassination attempt against John Paul II. But almost all traditionalists agree that the Vatican ’s version (and interpretation) of the third secret was not authentic, but another lie – another conspiracy. The impostor “Sr. Lucy” is of the same order. And that is why the Grunerites are forced to bend over backwards to attempt to explain away statement after statement emanating from the impostor Sr. Lucy which contradicts their position. The Grunerites have desperately tried to discredit this interview, since it is so devastating to their position; but Bro. Michael Dimond (superior of Most Holy Family Monastery) had a chance to speak with “Fr.” Pacheco when he came to visit the Monastery once for a conference in the 1990’s. “Fr.” Pacheco told Bro. Michael that something is very wrong with this Sr. Lucy, and that she couldn’t answer simple questions about her life. It’s quite obvious that the interviewers were simply probing too deeply in areas with which the impostor was unfamiliar. 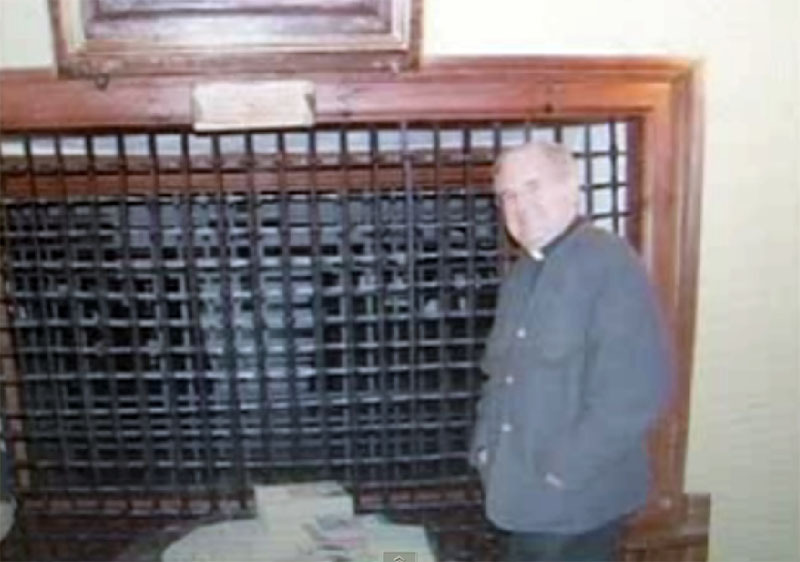 The Grunerites attempt to discredit this 1992 interview by pointing out that Sr. Lucy was always behind the grille, but in this interview she was supposedly out in the open, even holding hands with people. But this makes sense: the Vatican allowed one selective interview to an independent group – with Sr. Lucy out in the open and not behind the grille – in which she would tell them (and thus the world) that John Paul II successfully consecrated Russia so that it would be on the record with an independent group. But when “Sr. Lucy” was to meet with her sister (who could more easily have identified that she was an impostor), she was always kept behind the grille and with many other nuns. Of course, the Grunerites will claim that this interview was fabricated or distorted, but then they are admitting that there is a conspiracy! If the Vatican will go that far, it is certainly conceivable that it would implant an impostor; and, as we saw, the claim that all of these statements from “Sr. 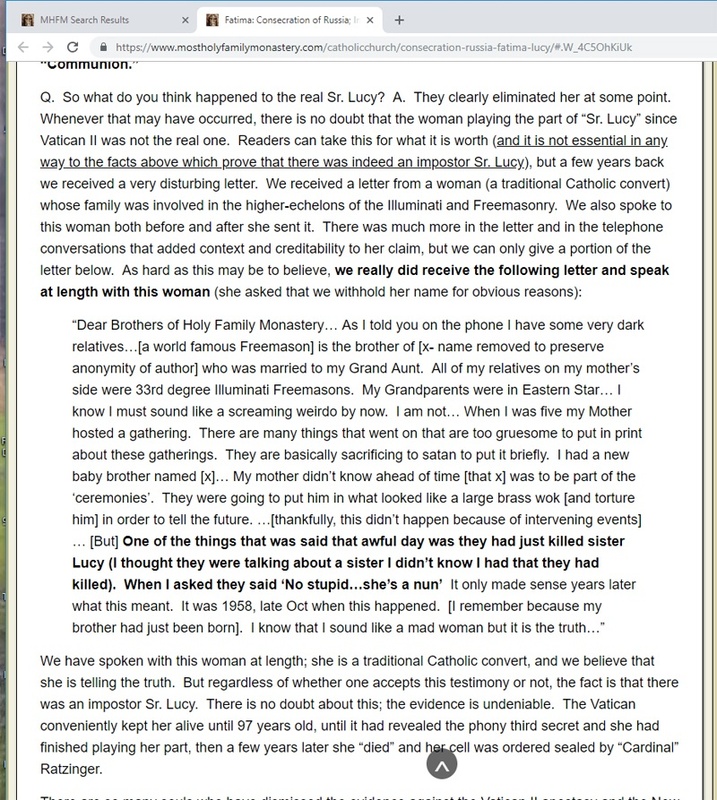 Lucy” endorsing the phony third secret are just fabrications is blown away by the video evidence in which anyone could see her endorse the Vatican’s version of the third secret at Fatima in 2000. Q. So what do you think happened to the real Sr. Lucy? We have spoken with this woman at length; she is a traditional Catholic convert, and we believe that she is telling the truth. But regardless of whether one accepts this testimony or not, the fact is that there was an impostor Sr. Lucy. There is no doubt about this; the evidence is undeniable. The Vatican conveniently kept her alive until 97 years old, until it had revealed the phony third secret and she had finished playing her part, then a few years later she “died” and her cell was ordered sealed by “Cardinal” Ratzinger. There are so many souls who have dismissed the evidence against the Vatican II apostasy and the New Mass simply because they saw that “Sr. Lucy” accepted them. We always informed them that they cannot dismiss facts of the Faith based on what they think another person believes. Alas, but lacking true Faith, they chose to follow man instead of God, and were actually following a complete impostor. Prior to examining this issue in detail, like almost everyone else we also held the popular position on the consecration of Russia : that the conversion of Russia necessarily means that the nation of Russia would be converted to the Catholic Faith, resulting in an astonishing reign of universal peace and Catholic renewal. We held it because that’s what every person writing on Fatima was saying, and there was really no reason to question it. However, as shown in this article, after studying the basis for this position, we came to discover that there is no basis for this position, and that it finds no proof in the words of Our Lady; on the contrary, a vastly different and much more plausible position does find its evidence in the words of Our Lady. There are many people who have held, and do hold, the erroneous position on the consecration and conversion of Russia in good Faith. (And strictly speaking, one is free to hold whatever opinion he feels inclined to on this matter, since it is not a matter of Catholic doctrine – even though the evidence presented in this article shows that the position of Nicholas Gruner on this issue is false.) Those who have held it in bad faith would be those who have dismissed the facts from the teaching of the Church on the present apostasy, and remained with the Vatican II sect or the New Mass, simply because they believed that one of the Vatican II “Popes” must consecrate Russia. That being said, I believe that the Fatima Enterprise of “Fr.” Nicholas Gruner has become a colossus with the assistance of the devil. His enterprise has been hugely important to the devil in distracting souls from the real issues of the Faith to get a phony Anti-Pope to consecrate Russia . Even if Russia had not already been consecrated, it is a fact that the Vatican II Antipopes are not Catholic and therefore have no authority to do it anyway. Thus, “Fr.” Gruner’s massive apostolate attempting to get the Vatican II Antipopes to consecrate Russia is a waste on two fronts: 1) he is trying to get non-Catholic, manifestly heretical Antipopes to do the consecration, when they can’t; and 2) his entire position on the consecration of Russia is wrong. Think of all the wasted time, resources and effort! Think – most importantly – of the souls who have been misled and distracted and have obstinately accepted the Vatican II Antipopes because (through their own lack of love of the truth) they dismissed the facts from the Magisterium, and held on to the Vatican II Antipopes because they believed that one of them must consecrate Russia. We hear from these people very frequently, and we’ve always assured them that they cannot dismiss facts from the teaching of the Magisterium based on their question of who will fulfill a prophecy. We always told them that against a fact there is no argument (heretics cannot be Popes), and truth cannot contradict truth, and therefore there is a good answer to their question about the consecration, even if one didn’t have it at the time. But alas, they dismissed all the facts from the teaching of the Magisterium, and accepted the Vatican II apostates because of their false idea that one of them must consecrate Russia . Now they can see not only that the sedevacantist position doesn’t contradict the message of Fatima in any way, but that their position was actually a deception that has kept them mired in darkness on the present situation. “Fr.” Gruner has actually become the fourth largest employer in Ft. Erie , Ontario based on his apostolate! That “Fr.” Gruner’s apostolate has been assisted by the devil finds corroboration in his devilish mixture of truth with error – of Catholicism with apostasy. We see this so clearly in the next quote about the apostasy in the Church. This really encapsulates “Fr.” Gruner’s evil methods and evil apostolate. Here we see Gruner discussing the truth of how it is predicted that the apostasy in the Church will begin “at the top.” Who could that be? Obviously it would apply first and foremost to John Paul II, the man who claimed to be the Pope (claimed to be the top of the Church) and led the entire apostasy by his idolatrous prayer gatherings at Assisi , his massive false ecumenism all over the world, etc. But while telling people about this truth (that the apostasy will begin at the top, or what seems to be the top of the Church), does he then warn them about the man to be most aware of, John Paul II? No, instead he does just the opposite: he then leads them directly to John Paul II – the one they should be most aware of regarding the apostasy – by quoting him as if he is their ally against the apostasy of the bishops and priests! This is totally wicked, even more so, in certain ways, than other more overt forms of wickedness, since it mixes truth with error (apostasy with Catholicism) and is more effective in leading conservatives back to the sources of the apostasy, the Vatican II Antipopes. That is why he has been able to effectively mislead and distract so many with a false message on Fatima . In addition to his deadly mixture of truth with error, one of the ways by which “Fr.” Gruner’s apostolate has become so influential is by propaganda. Here are some of the things that you can find on the website of his apostolate: His website (Fatima.org) calls his magazine “Our Lady’s magazine.” It states: “Click here to read more about Our Lady’s magazine…”! Boy, who would want to disagree with or not support “Our Lady’s magazine” – the magazine of Our Lady herself! Wow, he must be some “priest” to run “Our Lady’s Apostolate” – the Apostolate of Our Lady herself! – as well as her Radio Program, her magazine and her Book Service. Does anyone fail to see how presumptuous – and arguably blasphemous – this is? Oh, never mind… it’s okay… I almost forgot… Gruner is, according to his Apostolate (i.e. “Our Lady’s” Apostolate), “the Fatima Priest”! In truth, this is simply propaganda from a false prophet, and that is why “Fr.” Gruner has had such an influence on what people think about Fatima and the present situation. Propaganda is defined as “…organized scheme, for propagation of a doctrine or practice.” To dub almost every aspect of his apostolate “Our Lady’s” is an organized scheme on the part of his apostolate to build itself up as the voice of Our Lady herself. Besides being wickedly presumptuous, this propaganda brainwashes people just like the propaganda from the mainstream media. When they hear this stuff over and over – this is “Our Lady’s apostolate” and “Our Lady’s magazine” and “Our Lady’s Book Service” – they are often brainwashed to follow everything he says on Fatima, support him vigorously (for who wouldn’t want to support Our Lady?) or consider Gruner to be Our Lady’s personal representative. Since people are so gullible, it has been a major factor in how big his apostolate has become. That is why his apostolate continues to use this type of propaganda so often. It is why so many have been brainwashed not to consider anything on this issue that doesn’t conform to “Fr.” Gruner’s views. By the way, Gruner stated in one of his letters that he wants to send the book “Fatima Priest” (which is the story of his life) to every “Bishop” in the country! What a complete waste. The book Fatima Priest, which is replete with pictures of Gruner from throughout his life including as a baby, which is basically all about him and what a hero he supposedly is, has been translated into various languages to spread the “Good News” of Nicholas Gruner around the world. All of this explains why Gruner consistently promoted pictures of Anti-Pope John Paul II in his magazine for years (in a positive light) after he was aware of John Paul II’s apostasy. For Gruner, it wasn’t about telling people the truth; it was about keeping himself popular and seen as a hero with a somewhat mainstream “Catholic” audience – by promoting John Paul II and Fatima at the same time. Only a very wicked man would not have denounced John Paul II once he became aware of his apostasy, and that’s exactly what Nicholas Gruner is. Copyright © 2006: Most Holy Family Monastery. • The natural line of the thick, heavy eyebrows of Sister Lucy I is straight (photo 1a). The brows extend into the forehead area above her nose and past the inner corner of her eyes. • Some readers objected that eyebrows thin with age on some people, which would explain the clear difference between the brows. I don’t believe this is necessarily so. Even if this were admitted, without surgery or some artificial means, the shape of the one’s brows does not change from a straight line to an arched one, because the shape of the brows follow the shape of the bone structure of the forehead. • Regarding the focus of the eyes of Sister Lucy I, they seem normal with a small tendency toward extropia, or divergent strabismus, that is, the eyes slightly drift outward. 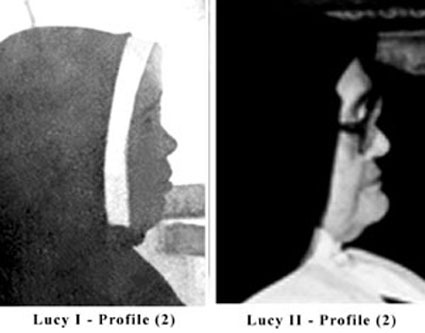 However, the eyes of Sister Lucy II clearly suffer from esotropia, or convergent strabismus, that is, the eyes strongly turn in toward the nose. 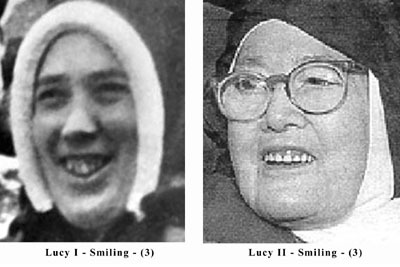 • When Sister Lucy I smiles, her upper cheeks (photo 1b) appear like two small round apples. • I could not find any photo of Sister Lucy I, smiling or serious, with her nostrils open. They do not flare naturally. All the photos of Sister II, however, show her with her nostrils flaring. They open naturally. • In his description of Sister Lucy, Walsh also notes her protruding upper lip and “heavy lower one” that hangs. The two lips have different widths. • Objectors argued that a possible denture would explain the different teeth of the two Lucys. I will treat the teeth as a special topic below in set 4. Here I will simply discuss the effect of the teeth on the lips of these two photos. • When Sister Lucy I smiles, the ends of her mouth point upward. But when Sister Lucy II smiles, the ends of her mouth point downward. • Another distinguishing feature of Lucy as a child that can be seen in her photos up to age 40 is a protuberant muscle in the middle of her chin, pronounced enough to form a dimpled area underneath (photo 1d, see also Set 6). But this muscle never appears in the photos of Sister Lucy II. • Sister Lucy I’s chin is strong but not salient. On the contrary, the chin of Sister Lucy II is a prominent chin. 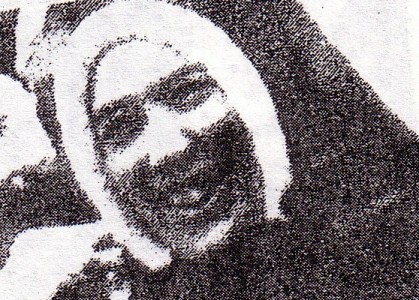 The latter has a square jaw, which does not appear in the photos of Sister Lucy I. The profile picture of Sister Lucy I was taken May 22, 1946 in the Chapel of the Apparitions at Fatima. Sister Lúcia II is seated next to the tomb of Francisco at Fatima on May 13, 2000. Their heads are in very similar positions, they are staring straight forward, and both have expressions of meditation or prayer. • One can also note in this profile close-up of Sister Lucy II how arched the brows are, confirming the previous observations. 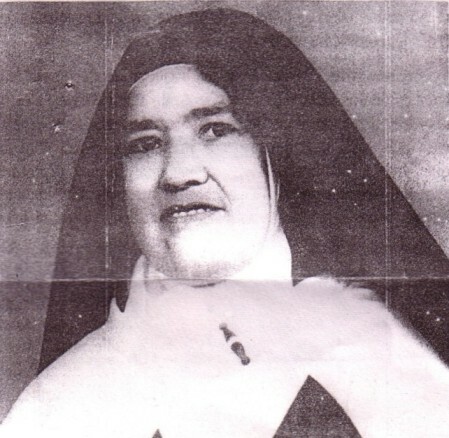 • The chin of Sister Lucy I, even though she is younger and not overweight, recedes sharply into her neck, with the tendency to disappear into a double-chin. However, the chin of Sister Lucy II, although she is older and heavier, juts forward and outward. It is so prominent that it forms a kind of platform extending out further than her nose. It is “lantern-shaped,” as one of my readers so aptly described it. 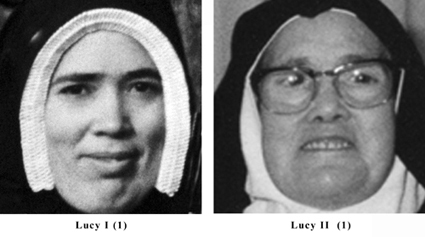 • In photo 3a, one notes the heavy, straight eyebrows that project forward on the forehead of Sister Lucy I. 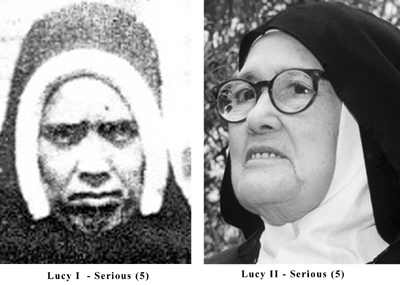 The arching eyebrows of Sister Lucy II are lighter and the forehead is flat where it meets the eyebrows. • In photo 3b, when Sister Lucy I smiles the shape of her mouth forms a U with the edges pointing upward. When Sister Lucy II smiles, the edges of the lips point downward in the form of an upside-down U. • Even when she smiles broadly, the lower lip of Sister Lucy I is thick, heavy and still a bit slack. When Sister Lucy II smiles, her lower lip is thin and tight. • The dimple and creases of Sister Lucy I appear again in this smile. But they are completely missing on the smooth cheeks of Sister Lucy II. • The nose of Sister Lucy II has marked nostrils that do not show on Sister Lucy I’s nose. • The round tip of Sister Lucy II’s nose extends downward. But the angular tip of Sister Lucy I’s nose extends upward. 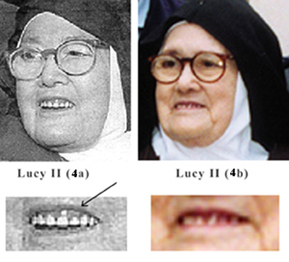 • The teeth of Sister Lucy I are clearly different, but since many readers pointed out the possibility that dentures would explain these differences, I will discuss this below in set 4 of photos. • The lower face of Sister Lucy I (photo 3c) is moon-shaped, narrowing at the bottom, with the strong chin sinking into the neck. The base of her face is oval. But, the shape of the lower face of Sister Lucy II is square, with her long chin extending outward. • In addition, since dentures are artificial, they never change their appearance. 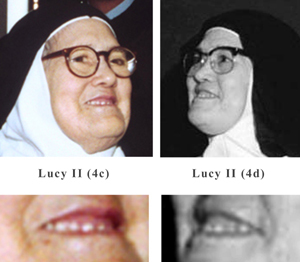 But at times Sister Lucy II's gums seem inflamed, covering one tooth (see arrow in photo 4a), as a reader pointed out; at times her gums seem to retract making some teeth appear longer as in photo 4b. • So, rather than dentures we could well be looking at the natural teeth of Sister Lucy II. 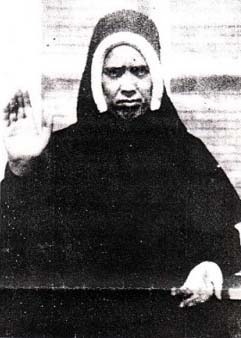 It is not so easy to find a picture of Sister Lucy II with a serious expression. Even when she is not smiling, her face lacks the swarthy tonus and brooding look of Sister Lucy I. 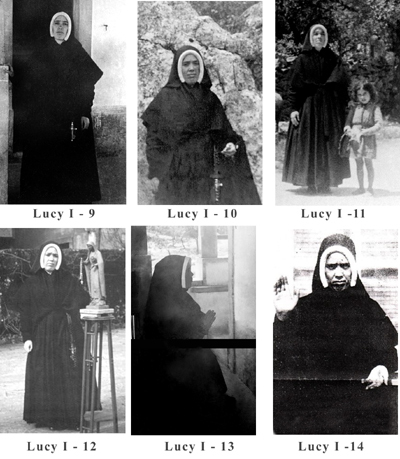 Photo 5 of Sister Lucy II, in which she appears serious, is from the cover of the 2004 edition of Fatima in Lúcia's Own Words. • Photo 5a emphasizes the typical brooding heavy eyebrows of Sister Lucy I that almost meet in the center of her face when she shows concern. A kind of furrow appears over the brows, stressing their heaviness. None of this is seen in Sister Lucy II. • The slight divergent strabismus can again be noted in the eyes of Sister Lucy I. On the contrary, a strong convergent strabismus is apparent in the eyes of Sister Lucy II. • In photo 5b, Sister Lucy I’s lips are set and closed tightly in an undulant line. Still, ample lips are apparent. 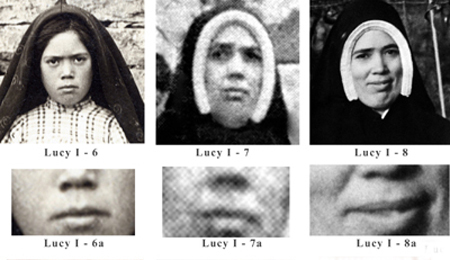 The shape of the mouth of Sister Lucy II, however, points down as always, the upper lip forming an upside-down U shape. Her thin, tight lips normally do not cover her teeth. • The two creases in the cheeks of Sister Lucy I that extend down past her mouth form two very straight lines. But the cheek creases of Sister Lucy II form arches. • Under the lower lip of Sister Lucy I there is a concave shadowed area. In it the contours of the muscle in her mid-chin can be noticed. 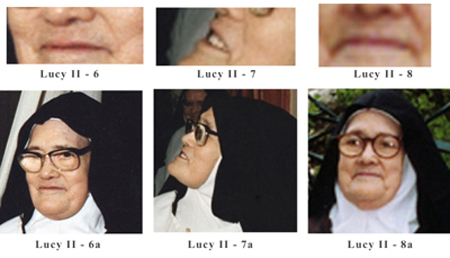 However, there is no concave space under the lower lip of Sister Lucy II, nor protrusions of any kind on the chin, even though one might expect this kind of defect to intensify rather than disappear with age. • Sister Lucy II seems to have lost the strong peasant-like rude features and skin of Sister Lucy I and taken on a much clearer skin tone, indicating to me a person of a different social background. • Admitting this change of skin tone, some readers argued that it could be explained by age, which makes the skin flaccid and clearer. Therefore, they argued, this would give the impression of a person of different nationality or social level. Since she was a child, Sister Lucy I had a long space between the base of her nose and the tip of her upper lip (photos 6a, 7a, 8a). In this space we also note a defined vertical groove, the philtrum, in the center. 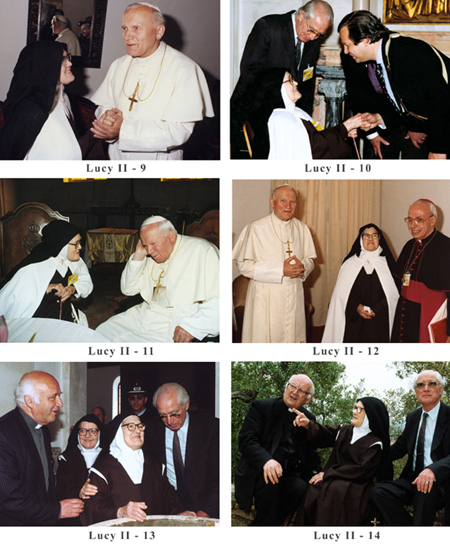 However, in the set of photos of Sister Lucy II (photos 11-9 to 11-14), we see a person with a different state of spirit. She is always smiling, at ease in public and relaxed in her postures and gestures. Some believe that this song is Jewish-Freemasonry making fun of Sister Lúcia or Lucy and Our Lady's 1917 Miracle of the Sun for the “rocking horse people” of Fatima, Portugal in 1917.